Are you looking for the top places to retire in Arizona? Let me show you the top places to consider for retirement in Arizona. Abundant sunshine, mild winter climate, palm trees and no humidity are just some of the reasons many people choose Arizona over other retirement communities. Pair that with active adult communities and resort amenities and you have the perfect combination for a retirement home. 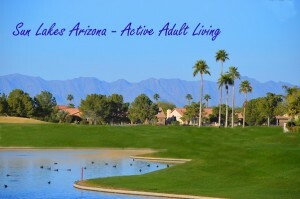 Dell Webb started the active adult community concept in Arizona with Sun City in the west valley of Phoenix. The expansion into Sun City West, Sun City Festival and others creates a population of 37,500. Many consider that a large city and prefer a smaller, more intimate community with large scale amenities. Each community has their own golf course, tennis and pickle ball courts, swimming pools, fitness center, restaurants and clubhouse. 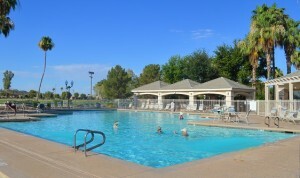 Many clubs and organizations are available to all residents within Sun Lakes. Sun Lakes Senior Softball and Sun Lakes Community Theater are two highly popular amenities offered to Sun Lakes residents. Cottonwood and Palo Verde are considered Phase 2 and share the same homeowner association. Ironwood and Oakwood are considered Phase 3 and share the same homeowner association known as IronOaks. You will find plenty of opportunities to meet new friends that enjoy similar interests. Our clients tell us that Sun Lakes is one of the friendliest communities and one of the easiest to make new friends. For more information on Sun Lakes and two other East Valley Active Adult Communities, see our Active Adult Lifestyle Video below. To see Sun Lakes Arizona homes for sale take a look below. Call us at 480-440-0849 to learn more about Arizona’s top places to retire!